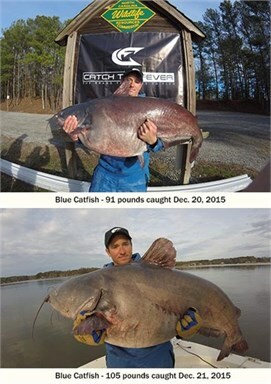 In December, a North Carolina angler caught two state record blue catfishes in a 24-hour period while fishing at Lake Gaston. Zakk Royce caught first fish on Dec. 20, which weighed 91 pounds and measured 53 inches in length. On Dec. 21, Royce landed his second state record, a 105-pound blue, measuring 55.75 inches in length. He caught both fish using cut bait. Both fish were weighed on certified scales at Ace Hardware in Littleton and examined and identified by District 3 Assistant Fisheries Biologist Evan Cartabiano. After the fish were weighed Royce released them back into the lake. The previous blue catfish state record was set back in 2006 by Eric Fincher of Mount Pleasant, who caught a blue catfish weighing 89 pounds from Badin Lake. Fincher released the fish back into Badin Lake after it was certified as the state record. To qualify for a N.C. Freshwater Fish State Record, anglers must have caught the fish by rod and reel or cane pole, have the fish weighed on a scale certified by the N.C. Department of Agriculture, witnessed by one observer, have the fish identified by a fisheries biologist from the Commission, and submit an application with a full, side-view photo of the fish.